If you are planning to build a deck, consider the benefits of an on-grade design. The beauty of a deck is that—unlike bare ground or lawn—it’s level, stable, supports furniture, sheds rain, and provides usable living space. Building a deck, however, requires more skill and understanding of construction principles than, say, building a patio. The simplest deck, called an on-grade deck, typically requires the installation of concrete piers to which beams and joists are attached. The perimeter joists, called rim joists, are doubled and then covered with trim boards. Depending on climate, the piers may need to be set on a footing that is several feet below grade. Check with your building department to find out what the code is in your area. Proper footings prevent the deck from ‘heaving’ should the ground freeze. Framing hardware, such as post bases and joist hangers, are used to join all framing members. 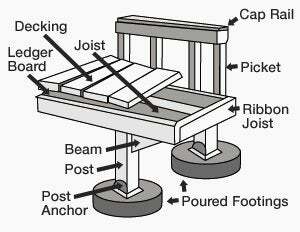 Decking (what you walk on) is fastened to the joists with screws or nails from the top, or with “invisible” fasteners from below. Such a deck will probably be less than a foot off the ground and therefore will not require railings or stairs, both of which complicate construction significantly. A door to the house will also complicate things. If it’s a step above the decking, you’re in luck. If you have to build one two or three steps to reach the door, you’ll also probably want to include a landing to make entering and exiting the house safer and easier. If the deck is adjacent to the house, it will require a ledger board. Typically, siding is removed and the ledger board is bolted to the house framing. Flashing should then be installed so that rain and snowmelt don’t enter the joint between ledger and house. If the deck is a freestanding ‘island’ deck, there is no ledger board. The higher a deck is off the ground, the more complex it is to design and build. Suddenly, you have to decide from which approach, or approaches, you’d like to access the deck. Skirting or landscaping must be used to hide the framing that supports the joists. Also, stair railings and balustrades must be built, adding to cost and complexity. Building a deck can greatly enhance the enjoyment of your yard, but spend time planning every step before pulling out your circular saw and nail gun. The nice thing about getting a deck under your belt, however, is that you’ll learn skills that will help when building many other projects, including garden sheds, porches, arbors and gazebos.